In this pioneering, erudite study of a pivotal era in the arts, Walter Frisch examines music and its relationship to early modernism in the Austro-German sphere. Seeking to explore the period on its own terms, Frisch questions the common assumption that works created from the later 1870s through World War I were transitional between late romanticism and high modernism. Drawing on a wide range of examples across different media, he establishes a cultural and intellectual context for late Richard Wagner, Richard Strauss, Gustav Mahler, and Arnold Schoenberg, as well as their less familiar contemporaries Eugen d'Albert, Hans Pfitzner, Max Reger, Max von Schillings, and Franz Schreker. Frisch explores "ambivalent" modernism in the last quarter of the nineteenth century as reflected in the attitudes of, and relationship between, Nietzsche and Wagner. 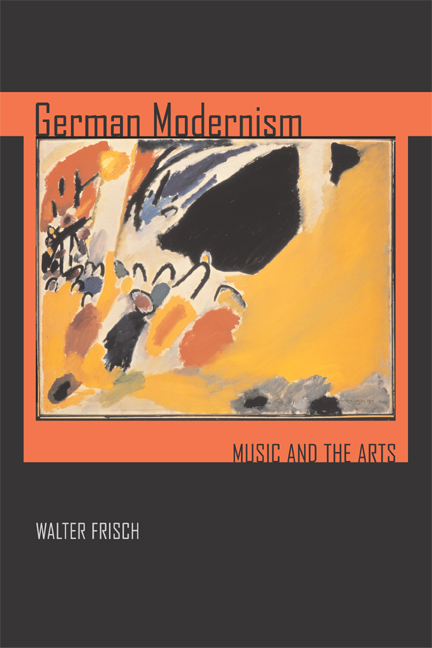 He goes on to examine how naturalism, the first self-conscious movement of German modernism, intersected with musical values and practices of the day. He proposes convergences between music and the visual arts in the works of Brahms, Max Klinger, Schoenberg, and Kandinsky. Frisch also explains how, near the turn of the century, composers drew inspiration and techniques from music of the past—the Renaissance, Bach, Mozart, and Wagner. Finally, he demonstrates how irony became a key strategy in the novels and novellas of Thomas Mann, the symphonies of Mahler, and the operas of Strauss and Hofmannsthal. Walter Frisch is H. Harold Gumm/Harry and Albert von Tilzer Professor of Music at Columbia University. He is the author of Brahms: The Four Symphonies (2003), The Early Works of Arnold Schoenberg, 1893-1908 (California, 1993), and Brahms and the Principle of Developing Variation (California, 1984).